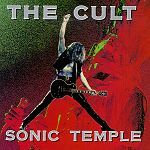 Sonic Temple is more than an album, it's an experience. Sun King and Fire Woman grab you and pull you in from the start with pure, loud, straight-ahead rock, then the gears shift to question you with American Horse. The beautiful wrenching tribute to the late Edie Sedgwick pulls you deeper, and with Sweet Soul Sister and Soul Asylum you're deep within the inner sanctums of the Temple. New York City brings you back to earth again with its raw intensity, and the rest of the tracks ease on out as smoothly as they eased you in. Not that they're lacking anything -- they may just take a few more listens before something in your head clicks and you discover what makes each special in its own way. This is the fourth and final album with original member Jamie Stewart on bass. It spawned radio hits and stadium concerts but beyond its commercial success, it's nothing less than perfection and magic. "Soul is one thing that The Cult have an abundance of. It's the passion within their lyrics that offsets the power of the music. It's the innocence found in their mystique... Soul is a rarity nowadays and The Cult are a throwback to the days when music was textured instead of processed."